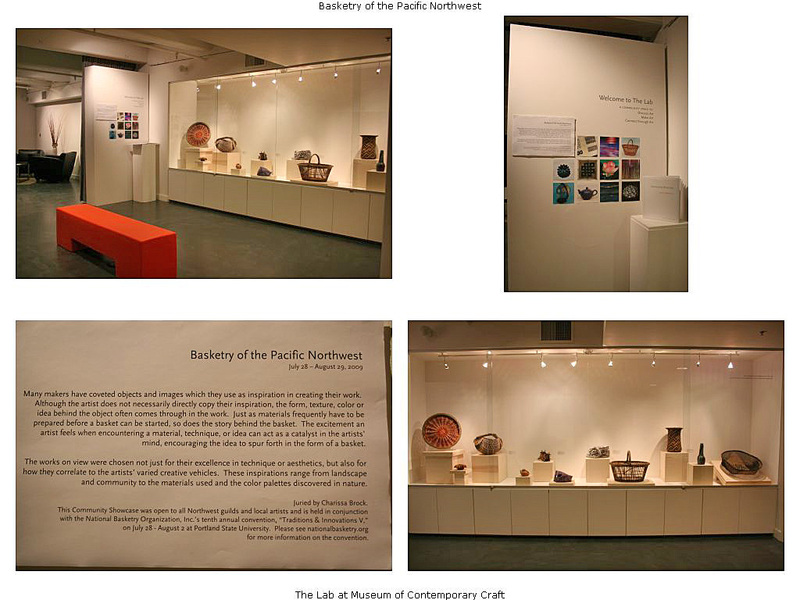 Katherine was pleased to be invited to participate in Basketry of the Pacific Northwest on view in The Lab at the Museum of Contemporary Craft in Portland, Oregon from July 28 through August 29. This exhibit is a small show in the Community Showcase which features Northwest basket makers, both traditional and contemporary. The show was juried by Charissa Brock and runs in conjunction with The National Basketry Organization‘s 2009 conference in Portland. The call for entries asked for basketry submissions that have an inspirational tie to an object or image that the artist has in their studio. For Katherine, one of her sources of inspiration are the baskets that she has made while learning from some of her mentors. 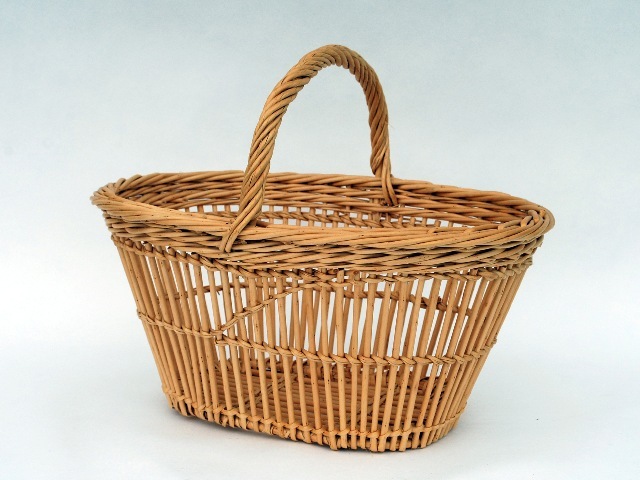 Below is a photo of an open work French basket that she made while taking a course with Norbert Faure at the Cooperative of Vannerie in Villaines-les-Rochers which inspired the oval panier a jour woven with green Dicky Meadows willow with peeled buff for the fitching in the photo above, one of the baskets accepted for the exhibit. Actually, Katherine was lucky to even apply for the exhibit. 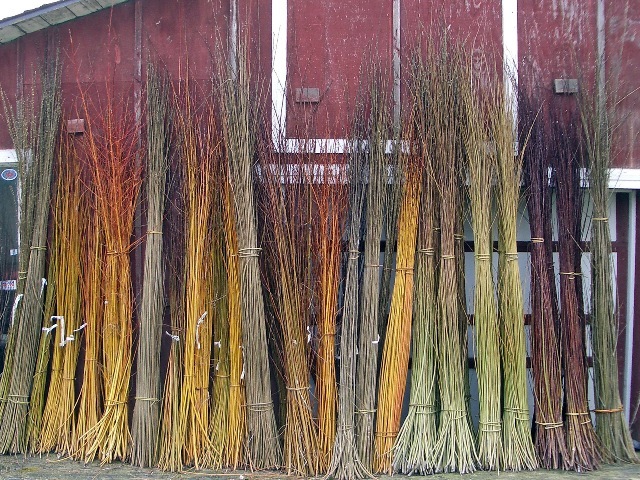 Thanks goes to Susi Nuss and her BasketMakers blog who posted on Tuesday, June 30 that the deadline for submissions had been extended to Monday, July 6. Ironically this was the first time we had even heard of this exhibit; so she had less than a week to consider submitting. (Though now Katherine can’t complain too much about my time following all the blogs!) The choice was made a little easier because Kat Perez at the Museum allowed the submission to be e-mailed. With other projects to complete, she could only squeeze in a couple of days to make some possible entries and get me to photograph them. As those of you who work with ‘brown’ willows know, it also depended on what was soaked up at the moment. 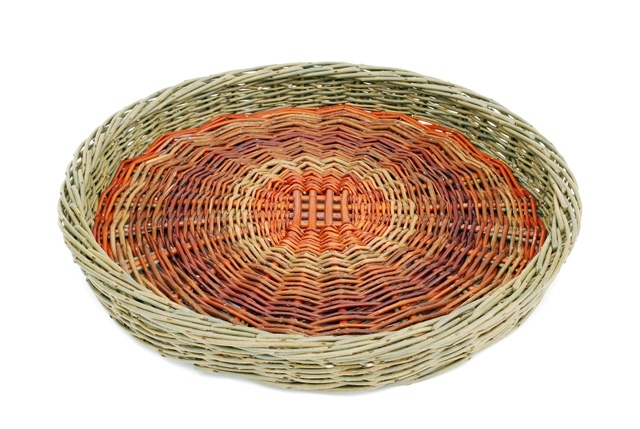 She decided on making baskets that are fairly typical of her work like the oval panier a jour and this tray that is based on an Irish potato basket. 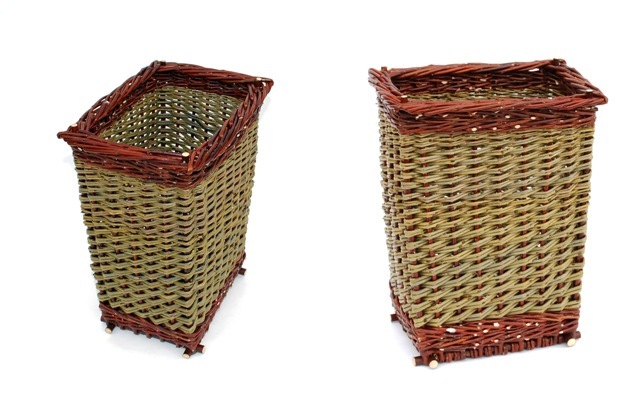 The inspiration for these trays are the willows we grow and harvest on our farm. Three submissions were allowed for each entry. The third basket Katherine submitted and the third basket she made last week to submit was the one not chosen. But we sold it for a wedding present today! But even if none of them had been selected, Katherine still needed more baskets for the local Skagit Artists Together studio tour this coming weekend. So if you’re in Portland, check out the Museum of Contemporary Craft and this exhibit which includes not only Katherine’s baskets but work by Pat Courtney Gold, Donna Crispin, Carol Horvath, Claudia Mullek, Patti Shaw, Shannon Weber, Linda Hendrickson, and Nanette Davis. We were sent this photo sheet by exhibition coordinator Kat Perez. You can click on the image to get a larger size. 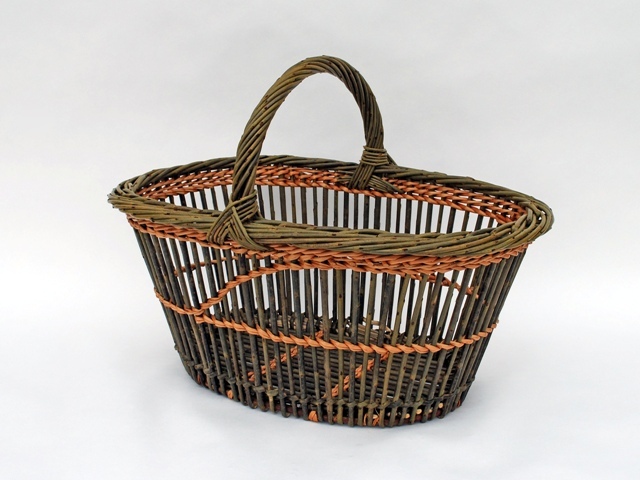 This entry was posted in basketry and tagged arts & crafts, basketmaker, baskets, Katherine Lewis, Museum of Contemporary Craft, National Basketry Organization, Susi Nuss, willow baskets by Steve@DunbarGardens. Bookmark the permalink. © 2008-2019 Steven Lospalluto & Katherine Lewis. All rights reserved. Visit Dunbar Gardens's profile on Pinterest.